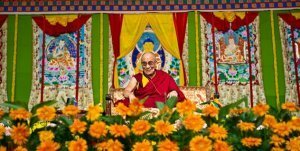 The Dalai Lama is now Prof Dalai Lama, thanks to Tumkur University which conferred honorary professorship on the 77-year-old spiritual leader on Tuesday. Within minutes of being honoured, the Dalai Lama said: "I'm a hopeless professor, as I don't have much time to do homework or teach students." He hastened to add: "Personally, however, this is a great honour." The Tibetan leader also inaugurated a two-day conference on 'yoga in education' at the same venue. The conference began with monks chanting hymns, followed by a speech in Tibetan to people from his community in the gathering. The Dalai Lama, however, promptly asked his translator to re-run the entire speech in English for the benefit of others, by gently pushing him on to the podium with his signature smile. "Now I will start my speech in my broken English," said the Nobel Peace Prize winner, beginning his talk on 'A human approach to world peace' as the crowd broke into laughter. "Indian civilization is very significant as it introduced the concept of ahimsa. All religions peacefully co-exist in harmony in India," he said, referring to the world's biggest religions like Hinduism, Buddhism and Jainism that were born in India, and Christianity, Islam, Judaism and Zoroastrianism, practised by Indians for centuries. He added that Indians should thank Tibetans for bringing back the treasures of their ancient culture, as Tibetan Buddhism was spread in Tibet by Indian monks centuries ago. The septuagenarian also said that violence, which was justified in past centuries for bringing a new shape to the world, has to be avoided in future as it threatens to wipe out humanity with the development of sophisticated nuclear weapons. "The solution to conflicts should be achieved using peaceful methods and meaningful dialogue, he said. "Many feel that dialogue is a sign of weakness, which is totally wrong. But in order to do so, one has to truly respect others, their lives and feelings, and this has to be done out of genuine concern of the well-being of others," he added.